As the NFL Draft looms less than two weeks away, we near the stretch run of our “Pick or Pass” series. Between now and the draft we’ll have two more pieces like this one, followed finally by my Big Board right before the draft. 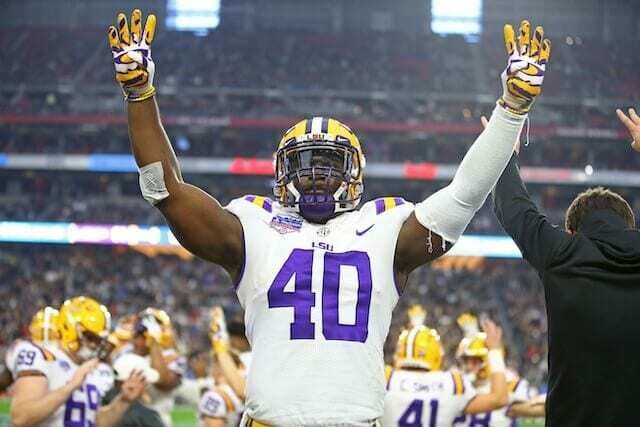 Today, though, we turn our attention to one of the most difficult-to-predict positions in the entire draft: linebacker. Before Roquan Smith came off the board at No. 8 last season, there had been just one inside linebacker taken in the top 15 going back all the way until 2013 (Hasson Reddick in 2017). While the position remains important once the games start, it appears as if the way teams value the position has changed. To be perfectly honest, it’s hard not to be impressed by everything that you see there. Two middle linebackers with explosive athleticism — all matched by tremendous production (especially in White’s case). So how might these guys fit with the Raiders? On paper, the Raiders remain desperate for a linebacker who can anchor their defense. Yes, they’ve signed Vontaze Burfict (who is still only 28 years old) and Brandon Marshall (29) — but neither guy is guaranteed to be around in a year. Given where the Raiders are as a franchise, they should be hunting for a long-term solution in the middle of their defense. That said, where the Raiders are drafting makes the fit a little more difficult given neither guy is likely to last into the 20’s. From my perspective, the dream scenario is Bush somehow falling to No. 24. Is it likely? Not at all — but again, given the weird perspective teams seem to have about middle linebackers (and Bush’s smaller stature), it’s not totally unreasonable. Who knows, maybe Oakland can package some later picks to move up a couple of spots and grab him. What about White? To be perfectly honest, when we entered this draft process, White was the guy I liked the most for the Raiders at No. 4 — back when the likelihood of a quarterback being off the board at No. 4 seemed low. Now, however, with Kyler Murray the heavy favorite to be the No. 1 pick, it changes everything. The Raiders are desperate for pass rushing help, and that has to be the team’s top priority. If Murray is gone before Oakland picks, it means either Nick Bosa, Josh Allen or Quinnen Williams is still on the board — any of which would be a slam-dunk, no-brainer. Which leaves White on the outside looking in. If somehow no quarterback has gone before No. 4 and the Raiders are looking at a board without all three pass rushers? White is up on my board (barring the opportunity to trade back).